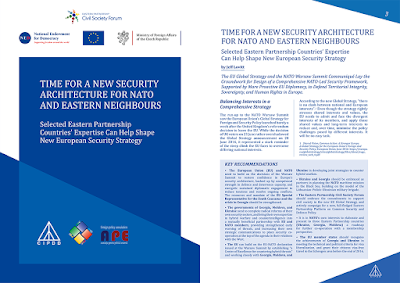 The security architecture in Europe is failing, argues Jan Piekło, one of the founders of New Diplomacy, in a paper published by the Cicero Foundation. Today's security architecture is based on the legacy of the Helsinki Final Act and the UN Charter - which the United States and the EU hoped would preserve peace on the European continent after the end of the cold war. However, in this Cicero Foundation Great Debate Paper, OSCE ‘BIS’: A NEW EUROPEAN SECURITY INITIATIVE, Jan Piekło argues that mutual trust between Russia and the West has deteriorated since the early1990s, starting with differences over the Balkan Wars, the war between Georgia and Russia in 2008, and now the continuing confrontation between Russia and the West over the Russian annexation of Crimea and the invasion of Eastern Ukraine. ‘Frozen conflicts’ in the post Soviet space have not been resolved despite efforts by the OSCE and others. Countries like Ukraine, Georgia, and Moldova, which have signed Association Agreements with the EU, now feel exposed, given the weakness of the OSCE and the UN and the failure of Russia, the United Kingdom, and the United States, to respect guarantees they offered to Ukraine in the Budapest memorandum of 1994. Jan Piekło suggests that a new soft security organisation, ‘OSCE BIS’, should be established. This new organisation should have Ukraine, Moldova, and Georgia - the signatories of the Association Agreements with the EU - at its core. Other members would be the US, Canada, the EU, and possibly Japan and South Korea, together with those post-Soviet states that can point to a consistent democratic record of government. The absence of Russia in ‘OSCE BIS’ would reflect the fact that Russia, over recent years, has used the OSCE to serve its own ends and paralysed OSCE activities when the organisation attempts to secure the sovereignty and democratic governance of states in the region. Once Russia establishes its own democratic credentials and withdraws from occupied territories, then it would be welcome to join the new organisation, argues Jan Piekło.